Clearly, I'm going to town on the crisper full of apples that we bought in North Carolina. They are exquisitely crisp and sweet, perfect for snacking on (Lila likes apple slices slathered with peanut butter) but as a baking enthusiast, I had to try them in some recipes too. There's nothing like the smell of baking apples to remind me that Fall is here. Well, that and the metric ton of dead leaves clogging up the yard that I'm trying my best to avoid raking. 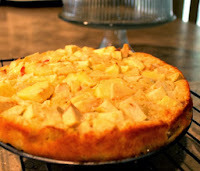 The first recipe I tried was Dorie Greenspan's French Apple Cake from David Lebovitz's blog. What's a French apple cake versus an American apple cake? Well, instead of the traditional and much beloved pairing of apples with cinnamon in American desserts, this cake is flavored with rum. Not to confuse a French recipe with an American idiom, but this recipe simply hits a home run. The cake is made of very basic ingredients, along with a dash of rum, as I said before. I used Bacardi Gold rum which sits in my pantry all year round only to be used in fruit cake. My only modification was to use 1/2 cup sugar instead of 3/4 cup. The apples are so plentiful that the batter is merely a coating for the apple pieces. This cake was a delightful treat, with soft chunks of apples in a cake so light and tender that it almost tasted like custard. I don't have much of a sweet tooth but I honestly kept coming back and stealing chunks of it all day. The second recipe came about when I needed to take a dessert to a gathering. I was longing to make apple pie but a pie only serves about 8. Normally. In my house, it serves 2 or 3. Anyway, I discovered that there is such a thing as a slab pie, that is, all the layers of a pie baked in a larger format like a 9 x 13 pan or a half-sheet pan. I found a recipe that called for pie crust to be patted into the pan- seriously makes things easier. Here's my tweaked version. This apple slab pie was an absolute treat, especially served warm (leftovers can be easily warmed in the microwave oven). 1. To make the crust, combine the following, cutting the butter into the flour. 2. Add ice cold water a couple of tablespoons at a time and mix until the pie dough just comes together. Pat this dough into the bottom of a 9 x 13 pan. Put the pan into the freezer while you make the rest of the layers. 3. Crumb topping: In a bowl, mix the following, again cutting the butter into the rest of the ingredients. 4. Apple filling: Peel, core and chop 6 apples. Toss them with 1/4 cup sugar, juice of 1/2 lemon and 1 tbsp. cinnamon. 5. Preheat the oven to 375 F.
6. Assemble the slab pie: Pour apple mixture into the pan and level it off. Scatter crumb mixture evenly on top. 7. Bake for an hour or until the filling is bubbling. These two recipes were both pinned to my Sweetest Things board and are Pins #2 and #3 for the Pin It and Do It challenge. Apple cake looks yummy. I would love to try this. Do you know if a toddler can eat this cake as it has rum in it? That depends entirely on the parents- many would say absolutely no to any alcohol, some allow a tiny bit in food. Personally, I would not give my toddler a boozy rum-soaked fruit cake (for instance) but would let her have a piece of this cake because it is only 3 tbsp. rum in the whole cake and it is added before baking. So yum! This has my mouth watering! 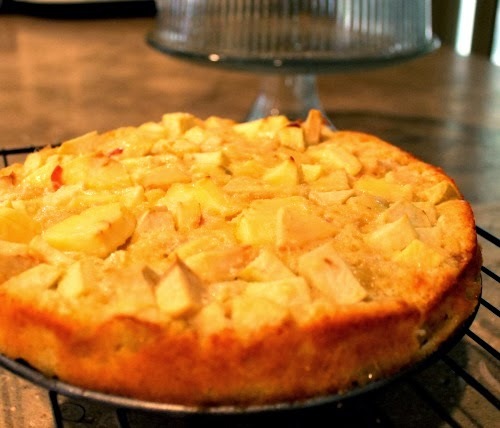 I am going try the apple cake this weekend! Oh and do we need a spring form pan for the cake or do you think any pan will work? I did use a springform pan. A regular pan should work if it is greased very well and lined with parchment. It is a delicate cake so don't be shocked if it breaks while lifting it out of the pan- it may not look perfect but will still be tasty. Let me know if you like the recipes when you try them! Ooh, I must try this recipe after your glowing recommendation. You know, I love baking so much and have made so many things over the past few years but have never made a crust or pastry dough from scratch. I think it's high time I try this. Anu- pastry dough is a joy to make. The pat-in kind is ridiculously easy and even the rolled kind is easy enough with a little practice. Good luck! Trish- the lemon juice added a slight tang and was great, especially since I used all sweet apples. Both Apple desserts look delicious! I want to make that cake but I don't have any rum, can I substitute it with some non-liquor flavoring? or it is must here like in a fruit cake? I am making the opera cake again tonight to share with a bunch of friends on Saturday and I made a really nice Mexican stew yesterday with roasted vegetables (mushrooms, zucchini, peppers, corn, tomatoes and onion), black beans, chipotle and ancho chillies. It was brewing in my mind ever since the weather got colder here, it is officially soup-stew time! I am so happy with the results. I am contemplating writing a blog. How much time do you require to maintain it? I fear the guilt of starting something and leaving it in the middle. Priti- the rum is the main flavoring for this apple cake. But I think you could try vanilla extract or almond extract for a result that is different but tasty. Your soup sounds awesome! I made something similar last night with a bit of quinoa and served it with tortilla chips. It is hard to say how much time it takes to maintain a blog. Countless hours :) just kidding. You can start slow with one recipe a week, say, and that would need probably an hour to post. Starting a blog requires no commitment, why should you feel guilty about trying something new to see if you enjoy it? :-) You know, I am having this with quinoa too! and I made this yesterday as well. I would love some tortilla chips with it. Well then, I will give it a go! The cake and the blog both. Thank you! You are the sweetest. Hugs! they like.I am an ardent follower of your blog and love the way you write. Preethi- that's so awesome!!! That's the sweetest compliment EVER. Thanks so much for reading my blog- I appreciate it. How lovely! My BF loves apple pie, I think the bottom one is great! Must try! Do try it, and I hope both he and you enjoy it. I love anything with rum in it! ;) Will get apples during this weekend's farmers' market trip to try out the cake! I tried Apple cake, it was tasty, everyone loved it! I am new to backing.. this was my second try (first was quatre-quatre). This cake turned out not airy/light, but was not raw either. Apples were soft. I felt, there was a slight excess of butter. I backed it for 40 min. If I would have kept it in for another 10 min would it make a difference? would it make it more light/fluffy? but would that make Apples go too soft? I know its hard to guess.. but any advice is welcome. Typo: I meant "you DID everything right"! Glad to know that! I was satisfied with the taste. Will try the muffin recipe next time. Thanks! !